Improvements and new features in General, SurfaceTrimmer, and BlastPlanner are equal to BlastMetriX 3D and can be found in the corresponding release notes. The MultiPhoto component has been extremely improved again. It computes better models with higher accuracy and it is faster than previous versions. Higher quality of 3D image reconstruction. New! Automatic continuation of reconstruction (dense reconstruction is automatically launched after coarse reconstruction after a user-defined time). New! Three different reconstruction modes (Fast, Normal, High). New! User-defined limit of generated points for the final reconstruction. New! User-defined stereo set-ups can be added to an existing 3D reconstruction. New! 3D model view for a better localization of the reference images. 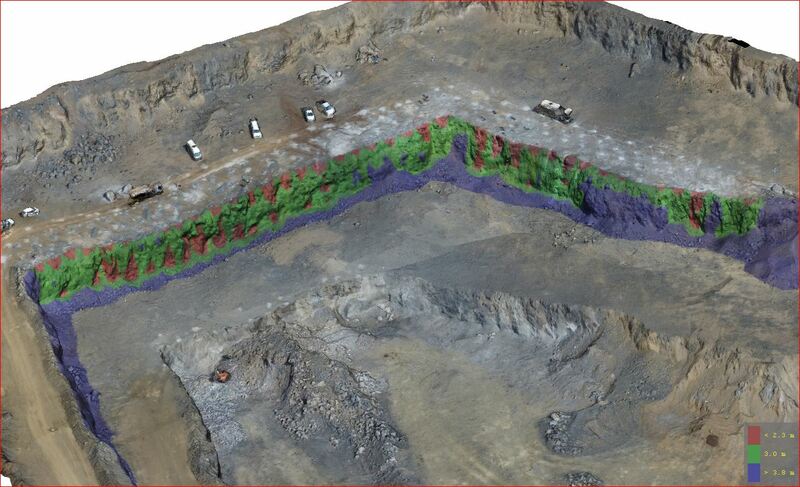 Defines and edits borehole collar positions on reconstructed 3D images; collars can be directly loaded into BlastPlanner. Reference points are saved in the correct subimage and are shown again after loading. Note: Reference points from previous versions are no longer imported. BlastMetriX 3D is released with 64-bit applications only. A dongle update is required (for most users) before installing BMX 4.1 in order to apply all new functions to the software. Drastic improvement of 3D mesh generation. Multiple calibration files can be installed and removed at once. New! Multiple connected dongles are supported. New! Option to set the displayed texture resolution for the 3D viewer. New! Backup/restore functionality for license data. New! ‘Clean up’ button for removing temporary data (only if 3GSM cache directories are found). The description of the Blast Site can be edited directly from the printing/exporting dialog. The set borehole inclination is saved. Even rows in staggered drill patterns (row shift bigger than 0) no longer extend beyond the width of the first row. Azimuth of boreholes is displayed as 0-360° (older versions: -180; +180°). New! Importing borehole rows from “.csv” files allows to add boreholes to the existing drill pattern (previous versions: an existing drill pattern was exclusively replaced). New! Rows can be added to an existing drill pattern.